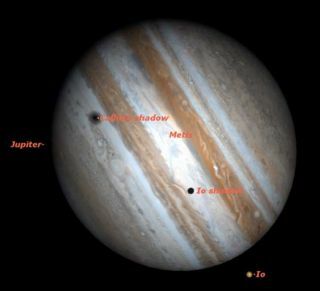 Two shadows crossing the face of Jupiter on December 20 at 6:15 p.m. PST. With Jupiter setting earlier every evening, opportunities for observing it are getting shorter. This week will be one of your last opportunities for this season to observe two shadows of its moons crossing its disk at the same time. As Jupiter's four large moons, discovered 400 years ago by Galileo Galilei, circle Jupiter, they regularly cast their shadows on it, causing solar eclipses to occur on the Jovian cloud tops. Occasionally two moons simultaneously cast their shadows, and just such a "double feature" will occur this week, on the evening of Sunday, Dec. 20. Although the shadows of Jupiter's moons are very small in diameter, they are intensely black, and so are visible in all but the smallest telescopes. During an earlier double shadow transit this summer, the shadows were readily visible in an 80mm refractor. Because of the short period between Earth's twilight and when Jupiter sets, this event will be best seen in the western half of North America, although part will be visible in the east. Here is the timetable for events for several typical locations so that you can determine when to watch where you live. In the table there are parentheses around event times on Jupiter which are either before local sunset or after Jupiter has set. The most interesting part of the transits are when both shadows are on the planet, the hour and 35 minutes between when Callisto's shadow enters and Io's shadow leaves, shown in bold in the table. The beginning of the double transit is nicely visible in eastern North America, but Jupiter sets shortly after the second shadow, Callisto's, enters the disk. Observers on the west coast will miss the beginning because the sky will be too bright to see Jupiter. By the time it gets dark, Io's shadow will already be on the disk, joined half an hour later by Callisto's shadow. The best view of all will be around 06:15 PST: Io will have just left Jupiter's disk, but its shadow and that of Callisto will still be cast on Jupiter, a great 3-D effect. If you are observing with a large telescope, you may notice a difference in the appearance of the two shadows caused by the different distance of each moon from the Jovian cloud tops. Io, which is in an orbit close to Jupiter, casts a small but very sharp shadow. Callisto, being the outermost of Galileo's moons, is far from the planet and casts a larger but fuzzier shadow. This difference is particularly noticeable when both shadows are visible simultaneously. Notice that Io leads its shadow across Jupiter's face by an hour and five minutes, because of the angle at which the sun is shining on it. Io is usually invisible while in front of Jupiter in all but the largest telescopes. Callisto, being in an orbit much more distant from Jupiter than Io, transited Jupiter 11 hours earlier.